When Shahkiel Akbar brought home a pair of black cotton socks from Primark, a budget retailer in the United Kingdom, he didn’t expect to discover a cry for help written in Chinese. That’s just what he found, though. 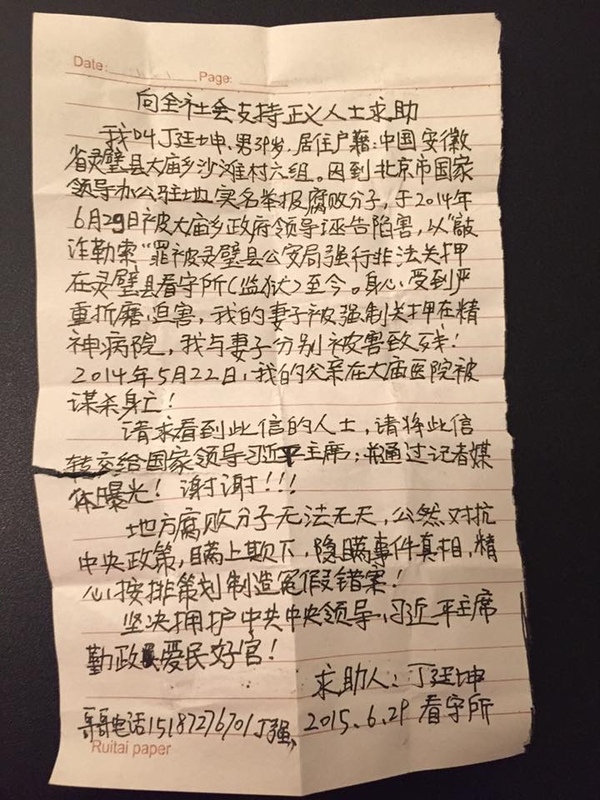 Dated June 22 this year, the letter, written with black pen on lined paper, claimed to be from a Chinese victim of torture named Ding Tingkun. “Currently I am forcefully detained at the Lingbi County Detention Center. My body and mind suffers severe torture and persecution,” the note reads in part. Tens days before Akbar’s discovery, the father of Lucy Kirk, another Primark customer, found a similar note written by the same Ding Tingkun, dated June 29, after buying a pair of socks from a Primark branch in Huddersfield, a small city in the middle of the U.K., British media reported. “My wife is detained in a mental hospital by force … my father was murdered in Damiao Village hospital on May 22, 2014!” that note read. The notes bore an eerie resemblance to a prison letter found in a Halloween graveyard set by Julie Keith, a donations manager at Goodwill, in 2013. That letter, written in broken English, was from the notorious Masanjia Women’s Labor Camp in northeast China, where extreme forms of torture were developed to crush the beliefs of practitioners of Falun Gong, a spiritual discipline heavily persecuted by China’s Communist Party. The timing of the Oregon discovery shone an international spotlight on forced labor in Chinese labor camps. “The Primark name is being used to gain publicity for the plight of this individual. We have found no link at all between this individual and any of our suppliers” factories in China, a spokesman of the company told the Daily Mail, a U.K. tabloid that reported the news. “We think it is likely that the note was added after production and it is feasible it was added in transit or at a port,” the spokesperson continued, according to the Mail. But it seems that Ding Tingkun is a real person, and that he was, or is, really detained in the same detention center as mentioned in the note in the socks. Multiple strands of evidence, available online in Chinese, indicate this. The strongest is a Chinese court verdict regarding Ding, dated May 19, 2015. The verdict is reproduced in the OpenLaw database, a Shanghai-based NGO that provides access to Chinese legal decisions. The verdict in the database was handed down by the Suzhou Intermediate People’s Court. It overturns a previous sentence—three years of imprisonment for “blackmailing and extorting money”—by the Lingbi County People’s Court on Dec. 8, 2014. Both courts are in the province of Anhui. Ding, in his letter, claims he was framed for extortion. The verdict overturns that decision for a lack of evidence, and orders that the original court conduct a retrial of his case. That verdict, in May, is just about a month before the date on the letters. It is very likely that Ding would still be in the same detention center, given the sometimes slow wheels of justice in the Chinese court system. The human rights lawyer Pu Zhiqiang, for instance, recently given a three-year prison sentence with reprieve, waited 19 months in detention before his case went to trial. Other evidence available online seems corroborative. For example, on May 15, 2014, (before Ding was detained) a blog post on Sina, a popular blogging service, is signed by a Ding Tingkun and Zhu Hongli, claiming that police in Wuxi, a city in the coastal province of Jiangsu adjacent to Anhui, “shielded thugs” and “hid the truth” of a criminal case. Similar language in that short post is used in the letter found in the socks. The telephone number listed in the post reaches an individual in China unconnected with the case. Further, in a comment on an article published in People’s Daily, an Internet user identifying himself as Ding Tingkun calls for help from the authorities and claims his wife is mentally ill. That post gives the surname of the wife as “Zhu” (the same Chinese character as the co-signatory to the above blog post) and says that she was being treated in the Suzhou Second People’s Hospital in 2011. 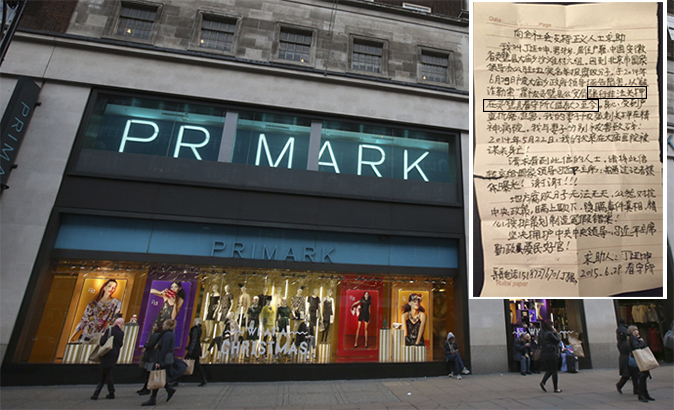 Primark did not immediately respond to inquiries about the evidence of Ding Tingkun’s identity.